The Whitworth Jazz Ensemble was named outstanding group in the college/university division at the 2010 Lionel Hampton International Jazz Festival, held Feb. 24-27 at the University of Idaho, in Moscow. This is the seventh time in the past 14 years that Whitworth's jazz band has received top honors at the annual competition. Seniors Kurt Marcum and Noah Peller were named outstanding soloists in the categories of trumpet and bass, respectively. "The music department faculty is very proud of our jazz students – of how hard they work and of how seriously they take this art form," says Dan Keberle, director of the jazz ensemble and director of jazz studies at Whitworth. "Their success at the Hampton Jazz Festival for more than a decade is indicative of the high-quality full-time and adjunct jazz faculty we have here at Whitworth." The 19-piece group performs several concerts each year on campus, as well as at jazz festivals, public schools and civic events, and on annual tours throughout the U.S. The group has also participated in international jazz residencies and cross-cultural trips to Munich, Rome, Melbourne, Havana, and Sao Paolo; the ensemble returned to Italy in January 2008. This January, the group traveled for the first time to New York City and New Orleans. "It's notable that most of the universities we compete against are not only larger than Whitworth, but they also have graduate students at the master's level playing in their bands, whereas Whitworth's jazz bands have always been undergraduate students only," Keberle says. In addition to its success at the Lionel Hampton Jazz Festival, the Whitworth Jazz Ensemble has been honored numerous times by being selected from colleges and universities in the five Northwest states to perform at the All-Northwest and All-State Music Educators Festivals. In recent years, Whitworth has welcomed some of the giants of jazz to campus; the ensemble has performed in standing-room-only concerts with guest artists including Lee Konitz, Terence Blanchard, Robin Eubanks, Kenny Garrett, Eric Reed, Nicholas Payton, Jimmy Heath and Joe Lovano. The ensemble has produced seven CDs; the most recent is Travelin' Light, released in 2008. 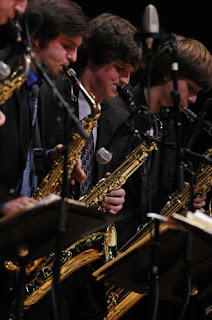 For more information on the Whitworth Jazz Ensemble, please visit www.whitworth.edu/jazzensemble. Dan Keberle, professor of music, director of jazz studies, and director of the Whitworth Jazz Ensemble, Whitworth University, (509) 777-4582 or dkeberle@whitworth.edu.